The doctor listened carefully to all my concerns. He gave me several options on how to solve my problem. Then hefixed my tooth BEAUTIFULLY! The doctor listened carefully to all my concerns. He gave me several options on how to solve my problem. Then he fixed my tooth BEAUTIFULLY! Came in for emergency visit on Sunday. I was taken in on time. Dr. was very polite and knowledgeable. He tookme out of pain. Will be coming back! 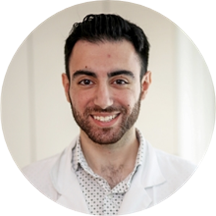 Fluent in English and Russian, Dr. Boris Israilov is a dentist who caters to the locals in and around New York, NY. He is available for consultations and examinations at 209 NYC Dental. He is of the belief that oral health is responsible for overall health, and hence strives to provide outstanding oral health care to all his patients. Dr. Israilov graduated from New York University, where he earned his dental degree. He then completed a residency at St. Barnabas Hospital. He strives to stay updated on the latest advancements in dentistry to provide suitable treatment options to his patients. Dr. Israilov understands that people are hesitant to visit a dentist and does his best to make sure that patient visits are comfortable and enjoyable. He understands the importance of quality care and believes in delivering it seamlessly along with professional patient service. I want to thank Dr. Israilov for being so gentle, I am terrified of dentists due to past experiences but he made this visit a pleasant one. From start to finish, my visit went smoothly. Dr. Boris was great at explaining the treatment & his calm personality made for a great bedside manner. My visit with Dr. Boris went well. Great doctor. Highly recommend! I really liked Dr. Boris's bedside maner. I felt very comfortable, answered all my questions. I'm very happy with results. My issue was addressed promptly, Dr. did a cleaning also, I left the office very satisfied with my visit.